Censorship is nothing new in Pakistan. State agencies have banned all manner of websites, movies, and TV channels. Journalists have been threatened, attacked, and even killed. Yet despite this heavy handed approach to trying to control the public narrative, the existence of the internet makes such a task virtually impossible. This is because it is impossible to control what is available on an globally connected information network, but also because even attempting to do so will naturally make the unwanted information spread. When Islamaphobic videos and cartoons were published in remote Western countries, these only became known in Muslim countries when right-wing groups projected them to further their own political ends. Attempts to ban these videos and cartoons not only failed, but caused even more to appear. Neither this is a problem only for Pakistan or Muslims, but even the most powerful countries in the world cannot achieve the impossible. After thousands of secret American documents were published by Wikileaks, America tried to block access to the site and even declared it a crime to look at them. Did this make the information disappear? No. Actually, it created hundreds of websites hosting the information on different servers around the world so that people could access it. Censorship in the internet age just doesn’t work. So why does the state continue to insist on trying to do the impossible? The answer is the root of our problems: Instead of facing a difficult and uncomfortable reality, we insist on trying to mold the reality to our wishes. The perfect example of this is Balochistan where instead of listening to the concerns of citizens, we try to silence any discussion. But why? If Baloch activists are truly separatists being fed by a foreign hand, letting them speak would only expose them just as TTP has exposed itself from its own statements. Threatening people not to listen to Baloch activists suggests that there is some legitimacy to their reservations. Ideas cannot be defeated through force. Only they can be defeated when they are exposed as lies or shown as less desirable than another idea. Resorting to threats and censorship as a means of stopping an idea is merely the admission that you do not have any better arguments. When it comes to state policies, this is the real problem. 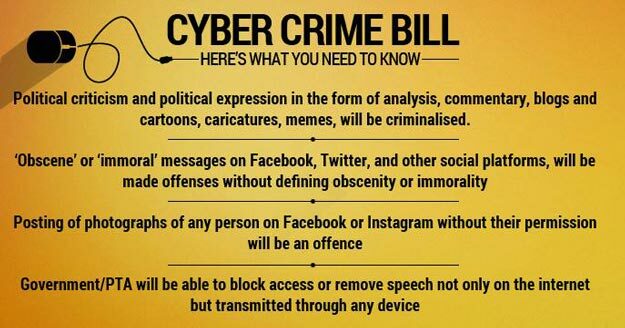 This entry was posted in Blogs and tagged Balochistan, cyber crime bill, free speech by Mukhtar Ahmed. Bookmark the permalink.